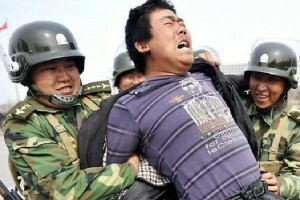 Oyannews: Chinese security forces burned ten Uighurs hiding in cave alive using flamethrowers, authorities reveal. It has been revealed that the Chinese army burned alive at least ten ethnic Uighurs they accused of terrorism last week in China’s autonomous Xinjiang region. According to People’s Liberation Army’s media, an operation was conducted by the Chinese special forces on 10 Uighurs who were hiding in a cave near Aksu city in the autonomous Xinjiang region. When special forces could not neutralise the Uighurs with hand bombs and tear gas, they fired into the cave with flamethrowers, after which media outlets announced that ten alleged “terrorists” in the cave were killed. China also announced on November 20 that it conducted deadly operations in the region and killed 28 people in a coal mine in September. Eleven of those killed were believed to be women and children, according to local sources. Senior Chinese officials have increasingly described the security challenges in Xinjiang as an important front in the global fight against terrorism. Hundreds of people have been killed because of the unrest in the Xinjiang region in the past two years, where China’s repressive policies – including control of religion and Uighur culture – have intensified. Analysts say, most of the economic benefits of the strategic region, which is crucial for China’s growing energy needs, have gone to the Han Chinese – the country’s biggest ethnic group – stoking resentment among Uighurs. The Communist party has also recently ordered Muslim Uighurs to stock and sell alcohol and cigarettes in attractive displays, despite the fact that many Muslims consider it a sin to sell alcohol for religious reasons. Uighurs are also subjected to discrimination in many respects, including being prevented from practising their faith openly, the banning of beards and headscarves and being prevented from teaching their children the Quran. Officials and people younger than 18 are banned from participating in religious activities. Rights groups believe Beijing is trying to systematically erase the region’s Islamic identity, but Uighur Muslims reportedly say that the restrictions have backfired and they have in fact become more religiously observant. Xinjiang, on the borders of Central Asia, Afghanistan, Pakistan and India, is the historic home to the Uighur people, who speak a Turkic language.